The Los Angeles International Airport is the third busiest airport in the US. The renovation of Tom Bradley international terminal at LAX was completed in 2010. The LAX has nine terminals in a central complex. The terminal 4 at Los Angeles International Airport. Latest update: A Transportation Security Administration (TSA) officer has been killed during a shooting incident at Los Angeles International Airport (LAX). LAX airport occupies 1,386ha of land. In 2008 the airport served 59.8 million passengers and handled 1.8mt of cargo. It is the world’s 13th-largest airport in terms of cargo handling. LAX is also the busiest origin and destination (O and D) airport in the world. The airport annually contributes about $61bn to the US economy. The LAX airport site, known as Mines Field, began its operations on 1 October 1928. The site was used for military flights during the World War II. Commercial airline service at the airport began in December 1946. The LAX terminal complex was built in 1961 along with a 172ft control tower. By the 1980s the airport had constructed international and domestic terminals along with a two-level roadway. A new 277ft FAA control tower with advanced equipment commenced operations in April 1996. The old control tower served the airport for 35 years. "Although most of the specifics had been determined there were controversial ‘yellow light’ projects." Because of the airport’s relatively urban setting any major expansion plans will always be met with opposition. The airport authority initiated a master plan in 1994 and has been modifying it ever since. The first phase was to research requirements, the second to develop alternative solutions and the third, begun in 1997, examined the environmental impact, with public consultation taking place between 1999 and 2003. The consultation process has continued due to some disagreement over the exact form of the expansion of the airport. The public outreach meetings to consider LAX master plan amendments took place in March 2007. Although most of the specifics had been determined there were some controversial "yellow light" projects. Initial studies predicted more than 157 million passengers and 8.9mt of freight a year will pass through the region’s airports by 2020. The three planning stages for expanding Los Angeles International Airport had provided four alternatives, A, B, C and D, to manage the requirements that future demand levels will bring. A, B and C mainly concentrated on the expansion of the airport to the west. 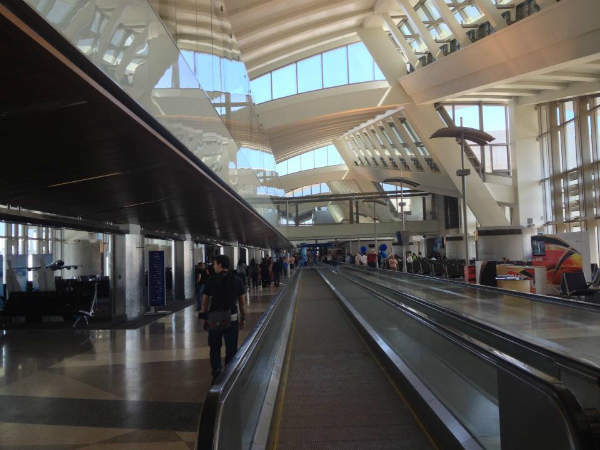 The proposals included the addition of new runways, a terminal, a concourse for Tom Bradley International Terminal (TBIT) and automated people mover (APM) systems connecting to the central terminal area. "The airport has nine terminals in a central complex." In 2005 alternative D was chosen as the favoured plan for the expansion of LAX and the cost of the airport reconfiguration was estimated at $11bn. However, in April 2007, LAWA suspended alternative D because of strong opposition from residents near the airport. The key component of alternative D was the restriction of vehicle access by moving passenger pickup and drop-off from the centre of the airport to a new ground transportation centre near the entrance with eight 1,400ft curbs and a 7,500-space parking garage. An APM would then connect to a new 6.5 million ft² terminal complex, which would replace the existing four million ft² terminal. Existing parking structures were to be demolished to make space for the expanded facility. An intermodal centre situated at the southeast corner of LAX would link light rail and buses to an additional 14,600 parking spaces. The plan also included realigning runways, extending the MTA green line to the airport and new consolidated car rental facilities. Gate space was to be reconfigured to accommodate larger gates for next-generation aircraft. The number of aircraft gates were to be decreased from the existing 163 to 153. 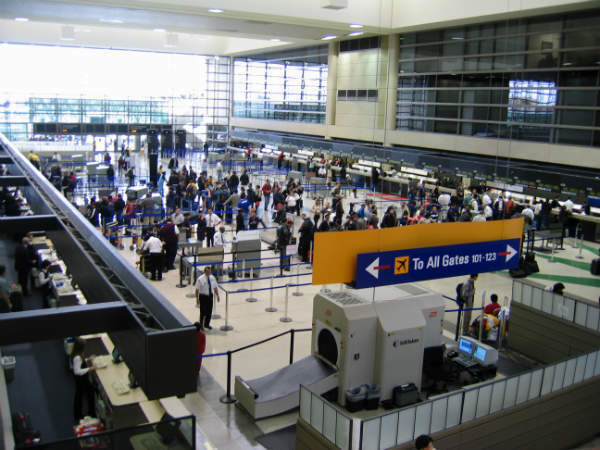 The mayor of LA believed that the changes would make the airport less of a terrorist target by removing the majority of vehicles from the terminal area and by enabling state-of-the-art screening technology. The revamp was scheduled for completion by 2015. Construction of a $13.5m Aircraft Rescue and Firefighting Facility was started at the airport in 2009. The replacement facility added 27,500ft² to the existing facility and responds to emergencies. The project received $10.8m from the FAA. Contractor for the project was TOBO Construction. The facility was dedicated in November 2010. In November 2008 a new plan was developed focusing on rebuilding and renovating existing terminals, giving priority to accommodate new larger aircraft and increase security. The modernisation plan involves remodelling of the airport infrastructure. It aims to create a greener and lighter terminal. 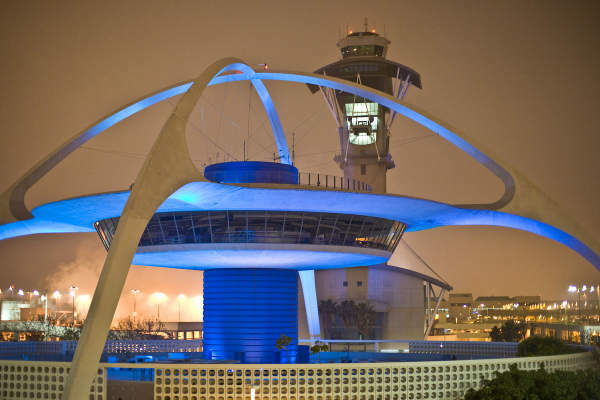 Fentress Architects was chosen for modernisation design of LAX. The new design is a roof top flowing in the form of rhythmic waves, inspired by the Pacific Ocean. The airport has nine terminals in a central complex with parking spots for about 140 aircraft. The total area of the passenger terminals is 3.8 million ft² and that of cargo terminals is about two million ft². The nine terminals in the complex are linked by a U-shaped two-level roadway. A free shuttle bus service is provided. The central terminal area has a baggage check-in facility on the upper departure level and a baggage claim at the lower level. The terminal also features cocktail lounges, duty-free shops for international flights, restaurants, restrooms, business centres and public telephones. The TBIT has a first aid station and special phones that are connected to the transport and hotels. Free Wi-Fi services were introduced at the airport in September 2012. LAX airport has four east / west parallel runways of 150ft wide: 24R/6L, 24L/6R, 25R/7L and 25L/7R. The uniquely designed control tower serves the four parallel runways, which are handled by individual ground controllers. The central position of the tower cab operates the gate-hold positions, flight data and clearance deliveries. The airport is served by about 80 passenger and 20 cargo carrier flights of all the major airlines. LAX airport also acts as a base for the US Coast Guard’s Air Station Los Angeles facility. The station is located near the north runway complex and is used for controlling oil pollution in coastal waters and maritime law enforcement. The airport has a total of about 25,000 parking spaces including 8,000 slots in the central terminal and about 11,000 in the long-term parking areas. Terminal 4 has valet parking. There is also public bus service of Metropolitan Transportation Authority Bus Center in the airport’s north-east. The north runway would be reconfigured to accommodate a central taxiway and give improved separation between runways. The southernmost north runway (runway 24L) would then be relocated approximately 340ft south, which would require the demolition of the existing Terminals 1, 2 and 3, and the northern portion of the TBIT. A new satellite concourse would be constructed just west of the TBIT to replace the gates demolished. The satellite concourse would be connected to the central terminal area (CTA) by an underground APM. On the south runway system, the southernmost runway (Runway 25L) was relocated approximately 50ft south to accommodate a new centre taxiway between the south runways to improve airfield safety. Construction of the $89m centre taxiway began in April 2007 and it was opened in June 2008. The contractor for the project was R & L Brosamer and construction support services were provided by Paragon Project Resources. The taxiway was a part of the $333.6m South Airfield Improvement Programme (SAIP). The new centre taxiway significantly improves airfield safety and reduces the possibility of runway incursions. The centre taxiway was designed by HNTB. CH2MHill acted as the construction manager and O&G and Tutor-Saliba were the general contractors. A new Intermodal Transportation Centre (ITC) located at the northeast corner of Imperial Highway and Aviation Boulevard will provide the primary short-term parking for the airport with access by APM to the CTA with one stop at the new consolidated car rental facility. The ITC will improve transit access with a direct connection to the Metro Green Line’s Aviation Station and serve as the connecting point for regional transit buses and future MTA rapid buses. A pedestrian bridge with moving walkways will connect the Green Line Imperial / Aviation Station directly to the ITC and the APM system to the CTA. The consolidated rental car facility (RAC) consolidates all on-airport rental car operations for LAX for the convenience of passengers and improved efficiency for the car rental companies. The new facility is to be connected via the new APM to the CTA and ITC to alleviate the traffic impacts of multiple shuttle buses. Security screening of passengers and baggage would be introduced for passengers prior to boarding the APM trains. The APM is intended to connect the GTC, RAC and ITC to the CTA. The trains will be designed to accommodate passengers along with luggage and trolleys. The service would run every two minutes with a waiting time of just one minute. 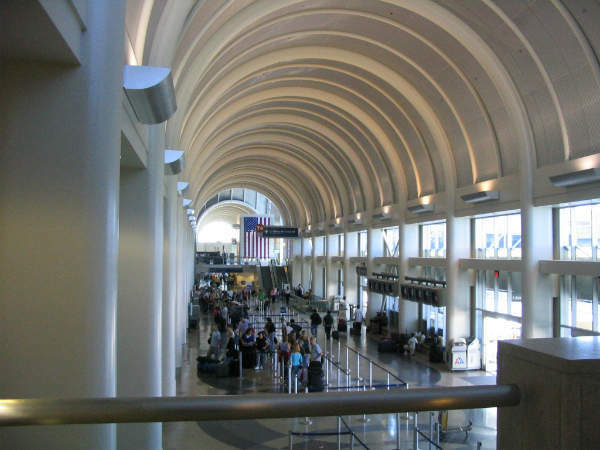 "In February 2007 the $737m renovation of the Tom Bradley terminal began." In February 2007 the $737m renovation of the Tom Bradley international terminal (TBIT) began. It was the largest individual project in the history of the City of Los Angeles. The ground-breaking ceremony occurred on 26 February 2007 and was officiated by the Mayor of Los Angeles, Antonio R Villaraigosa. The construction of the project was completed in March 2010. The project included major interior renovations, installation of an in-line checked-baggage security system and a second boarding gate for new large aircraft such as the A380. Cost of the construction work was $567m, while $170m was allocated for architectural and engineering design, construction of passenger boarding bridges, terminal offices and lounges. Leo A Daly offered architectural and engineering support. Major sub-contractors of the project included Bragg Crane & Rigging, Key Air, ISEC, Murray Company, Nuprecon, Standard Drywall, Siemens Airport Logistics and Sasco. The construction work was performed while the terminal was fully operational. The terminal was first built in 1984 and this was its first major renovation. The project added approximately 45,000ft² of space in the terminal and incorporated a $140m, in-line baggage security screening facility. Passengers can check in, receive their boarding passes and then check their luggage with the airlines, where it is conveyed to security screening and then to flights. The large explosive detection machines currently in terminal lobbies are replaced with newer-generation machines with higher efficiency and throughput and moved to the new security facility. This effectively reduces congestion in the ticketing lobbies by removing the need for passengers to wait with checked luggage while it undergoes security screening. A $270m elevator and escalator modernisation programme was initiated at the terminal in May 2009 and is expected to be completed in June 2016. Contractor for the project is W.E. O’Neil Construction. Equipment for the project will be provided by KONE and Schindler. The $1.9bn TBIT improvement programme was launched in 2010 encompassing a number of upgrades to the terminal. The first phase of the upgrade was completed and became operational in September 2013, while the overall project is scheduled for completion by 2015. The renovation was designed to make the terminal more comfortable and convenient with interior improvements that included upgrades to the lower / arrivals level lobby and concourses for inbound international passengers, restrooms, accessibility measures for passengers with disabilities, new elevators and escalators, new paging and clearer signage, better temperature control and ventilation, fire and life safety systems and electrical systems. "The terminal receives more efficient heating and ventilation." Additional renovations to the passenger boarding lounge and outside ramp area at Gate 123 on the north end of the terminal concourse will effectively create a second gate to accommodate the new generation of jets such as the Airbus 380 and Boeing 747-800. Another gate on the south end of the terminal concourse (Gate 101) was renovated in mid 2006 to accommodate the new jets in advance of test flights to increase airport compliance as it will need to accommodate larger planes as it is a major Asian feeder hub. Terminal 5 is currently undergoing a $229m renovation to improve the passenger service and security with scheduled completion in 2015. Delta Air Lines is also investing in the project. Terminal 6 was renovated at a cost of $238m in 2012 increasing the lobby space and modernising the passenger facilities. A $20m project to construct four new lounges on the fourth and fifth floors of TBIT was started in October 2006 and completed in January 2008. The project was completed in four phases and was financed by airline participants. The four lounges feature new amenities and furnishings, which replaced 16 individual lounges and expanded the terminal’s overall lounge space to 46,972ft² (an increase of 72%). Three of the new lounges serve airline alliances and the fourth for customers of airlines not affiliated with an alliance. The terminal receives new modern technology such as dynamic video monitors that automatically update flight status and information technology components that support the upgrades and promote better passenger flow. This project was the first at Los Angeles Airport to incorporate Leadership in Energy and Environmental Design (LEED) standards developed by the US Green Building Council. The terminal receives more efficient heating / ventilation / air conditioning systems and more efficient electrical and lighting systems, which reduces energy consumption, while new plumbing systems increase water conservation. Over 75% of the construction and demolition waste was recycled or salvaged and the design featured local and sustainable building materials and finishes. The overall budget for the LAX capital improvements programme is $4.1bn. The overall cost of terminal renovation project was $737m. The airport has already invested $147.9m in architectural and engineering designs, purchase of new passenger loading bridges and construction of the first boarding gate for next-generation jets, lounges and terminal operations offices. The project was funded by a combination of sources, including passenger facility charges, airline reimbursements and airport revenues. The US Transportation Security Administration partially paid for the in-line baggage security screening system. Construction of the TBIT was carried out by a Clark / McCarthy joint venture, which is comprised of Clark Construction Group based in Bethesda, MD, and McCarthy Building Companies of St Louis, MO. O’Connor Construction Management provided cost estimating, CPM scheduling, phasing studies, constructability analysis and value engineering. Parsons acted as the construction manager for the project. LaGuardia International Airport in New York, USA, is currently undergoing the LGA Redevelopment Programme to provide world-class airport facilities for passengers and airlines. Charlotte Douglas International Airport (CLT) is located on the west side of Charlotte city, North Carolina, US.